Merritt “Kirk” Kirkpatrick and his Bellanca Pacemaker in 1938. Courtesy of Alaska Airlines, Merle Smith Collection. 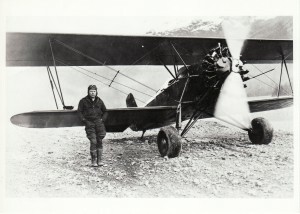 To a nation plagued by economic despair, Alaska and its heroic aviators were thrust into a powerful, twofold position: Bush pilots were seen as pioneers, instrumental for bringing reliable and safe air service to the Alaskan mainstream, while at the same time, they were perceived in the popular imagination as symbols of frontier rugged-independence. 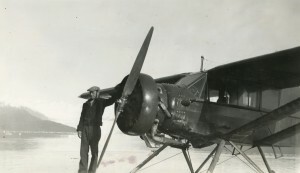 Harold Gillam seated inside his Pilgrim airplane, getting ready to deliver the mail. #95-46-95, courtesy of the Cordova Museum, Cordova, Alaska. The strikingly handsome and reportedly “moody” Harold Gillam probably most represented the Skyboy’s image of the “strong and silent type.” Asked to write a poem about his favorite person, a third grader from Cordova captured perfectly, if not thriftily, the public’s sentiment toward the pilot: He thrilled em/ Chill em/ Spilled em/ But no kill’em/ Gillam. Not only did Harold Gillam pioneer commercial air service in the Wrangell Mountain region, but he was famous for his pet polar bears, his “cat-like” vision, and his uncanny ability to fly in weather, known to all pilots as “Gillam weather,” that kept most sane flyers grounded. 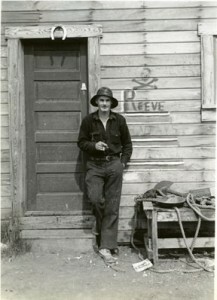 Bob Reeve at his shop in Valdez, Alaska. UAA-hmc-0396-14a-30, Russ Dow Collection, Archives and Special Collections, Consortium Library, University of Alaska Anchorage. Merle “Mudhole” “Smitty” Smith was probably the most “grounded” of eastern Alaska’s early pilots. Once established in the flying business, Smith filled the role of promoter, rather than cowboy. Born in Kansas, Smith, like Buffalo Bill himself, mastered his profession as an entertainer, barnstorming throughout the Midwest with a group called the Flying Circus. In the 1920s, barnstorming was a popular form of entertainment, in which pilots like Smith performed stunts and tricks with airplanes. 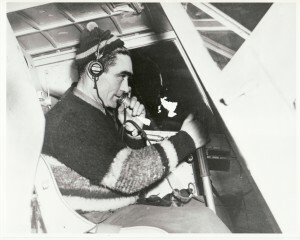 Barnstorming, however, was a tough way to make a living, so Smith came to Alaska in 1937 to work for Merritt “Kirk” Kirkpatrick, who had started Cordova Air Service (CAS) in 1934. Merle “Mudhole” Smith poses with his Stearman C2B biplane. #95-46-54, courtesy of the Cordova Museum, Cordova, Alaska. The concept of Alaska as the Last Frontier was not just familiar—it was universal, it was a centerpiece of America mythology. Smith tapped into peoples’ nostalgic perceptions of the Wild West, basing his Alaskan tourism business on quirky miners, cowboy-pilots, and gold dreams, even though Kennecott, his most popular tourist destination, was built by Gilded-Aged industrialists and elite bankers whose modern milltown and railroad sought to remove copper rather than the more romanticized gold from the Wrangells. Smith marketed his Last Frontier advertising campaigns to curious urbanites, who embraced the promise that Cordova fly-in trips would transport them to unique destinations, while at the same time, transport them back in time—an idea inspired not by his years in Alaska, but rather a visit to California’s primary tourist destination, Knots Berry Farm. Still, although we like to think of Alaska’s bush pilots in the same vein as the American cowboy, it is important to remember to appreciate the ‘real’ flyers rather than those shrouded in romance and myth. The flyers represented here—Gillam, Reeve, Kirkpatrick, and Smith—were highly competent pilots, who developed unique skills and knowledge of Alaska’s demanding environment in order to establish a vital and visionary profession. These aviators brought eastern Alaska into the modern age, while at the same time, reinforced a resourceful, innovative, and even defiant frontier identity that continues to resonate with residents living in the shadow of the Wrangell Mountains today. To learn more about these Alaska flyers, as well as many others, visit the Anchorage Museum’s current exhibit, Arctic Flight: A Century of Alaska Aviation. The exhibit opened in February and will run through August. 1. Stephen E. Mills and James W. Phillips, Sourdough Sky (New York: Bonanza Books, 1969), 5. 2. R.C. Reeve, “Statement Before the Civil Aeronautics Board, In the Matter of the Application of Reeve Airways, Valdez, Alaska, for a Certificate of Public Convenience and Necessity, Exceptions to Examiners Reports, Docket No. 340,” August, 1939. 3. “Caught in the Wild,” Valdez Miner, December 13, 1935. 4. “Pilot Bob Reeve Holds World Record for Highest Landing: Local man Lands on Glacier 8500 feet up on Mt. Lucania,” The Valdez Miner, June 25, 1937.